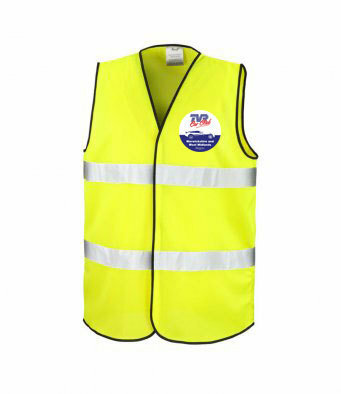 Hi-Vis safety vest, ideal for events or for Regional Organisers so you can be indentified at meetings. Colour printed TVR Car Club logo on chest, this can have your Region name added FREE of charge, and "Regional Organiser", "TVR Car Club Regional Organiser", or "TVR Car Club Events" on the reverse in purple lettering. Plus you can even add your name on the front as an optional extra. Easy close tear release front fastening. Sized to be worn as an over garment. Please note: TVRCC clothing is manufactured to order and cannot be returned except for manufacturing defects.